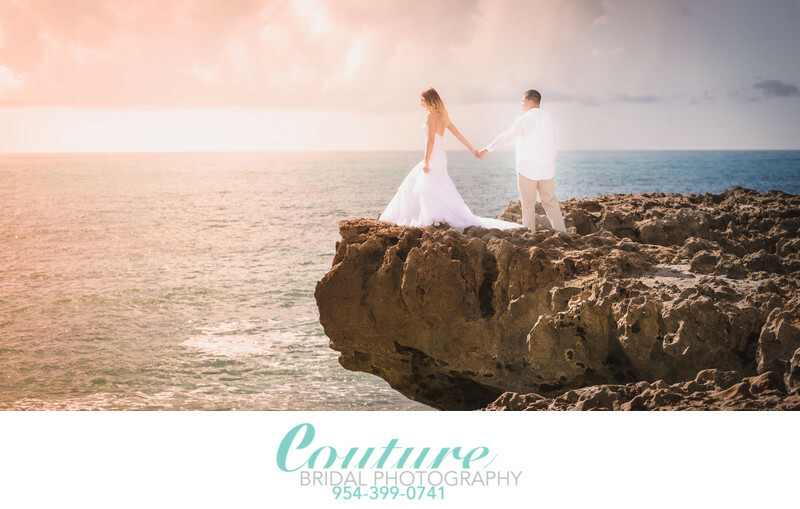 Couples and brides throughout Fort Lauderdale, Miami and Palm Beach searching for the best Wedding Photography choose Couture Bridal Photography as their most preferred wedding photography studio. Couture Bridal Photography offers the most extensive story telling wedding photography at the most affordable rates anywhere in South Florida. Couture Bridal Photography is also a provider of Destination wedding photography services worldwide. Couture Bridal Photography is a boutique luxury wedding photography studio specializing in the most artistic fine art wedding photography brides around the world not only the best in Fort Lauderdale, Miami and Palm Beach, but worldwide. Couture Bridal Photography is an award winning published wedding photography studio recognized internationally among the worlds bridal publications and wedding photography organizations as one of the "top 20 wedding photography studios in the United States". Couture Bridal Photography was established in Fort Lauderdale in 2008 to fit the needs of brides searching for wedding photography that told a story and consisted of more than snapshots taken throughout a wedding day. Couture Bridal Photography is the only boutique luxury wedding photography studio in Fort Lauderdale Florida and serving the world that is known worldwide for our style of wedding photography. Couture Bridal Photography is known worldwide for delivering the most elegant, romantic and timeless wedding photography throughout Miami, Fort Lauderdale, Palm Beach, The Florida keys and destinations worldwide. Couture Bridal Photography started by Alfredo Valentine, a lifelong student of photography with over 20 years of photography training and experience chose to specialize in a unique story telling style of wedding photography commonly found in europe by the finest wedding photographers in the world. Couture Bridal Photography is known for providing the highest quality artistic images to every bride from every wedding using the most advanced photography techniques and practices only utilized by masters of professional photography. Couture Bridal Photography is also famous for offering the most flexible payment terms and affordable custom wedding photography packages tailored to every couples individual needs, desires and most importantly wedding day budget. Couture Bridal Photography works with every couple, bride, budget and type of wedding with the flexibility and professional approach Couture Bridal Photography is known for throughout the world. Couture Bridal Photography has a team consisting of the most talented wedding photographers, Photographers and and wedding photography assistants in the US to provide the most consistent and pleasing wedding photography. Couture Bridal Photography accepts only a limited number of engagements throughout the year with two lead photographers. Alfredo Valentine and Giovanni Gutierrez are the lead wedding photographers at Couture Bridal Photography and AJ Knapp is a wedding photography assistant and second shooter on every wedding photography assignment captured by Alfredo Valentine. Couture Bridal Photography is the most recommended wedding photography studio among brides in Miami, Fort Lauderdale, Palm Beach, Boca Raton, Deerfield Beach, Pompano Beach, Boynton Beach, Key Largo, Key West, Coral Gables, Hollywood, Palm Beach Gardens, Jupiter, Hobe Sound and many more for the ultimate wedding photography and wedding photography experience possible. Call Couture Bridal Photography for the latest deals and offers on Wedding Photography anywhere worldwide now at 954-399-0741 or email us for a free consultation. Location: 5 North A1A, Jupiter, FL 33477. 1/1000; f/3.2; ISO 100; 70.0 mm.